1. To post content, you must first LOG IN or SIGN UP. 2.a) For PC and tablet users, click the NEW POST Button. Click the NEW POST Button in the top center of the screen. 2.b) For smartphone users, tap on New Post in the ME menu. Find ME in the upper right of your screen. Tap on it to open the sub-menu. Scroll down until you find New Post, and tap on it to open the New Post template. 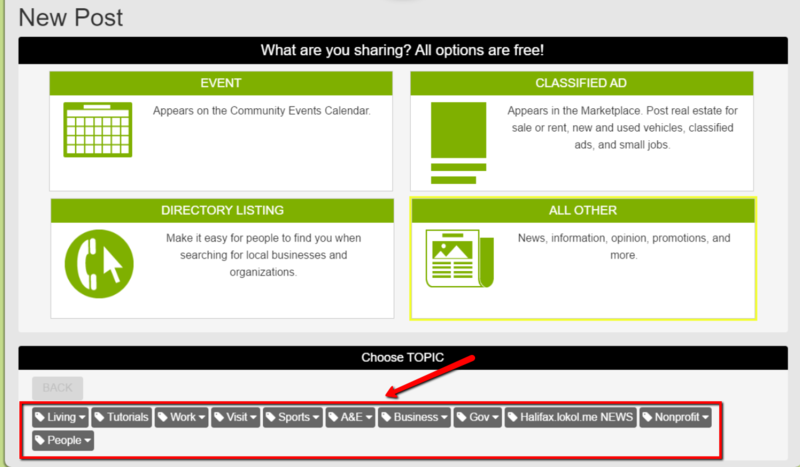 Posts can be created as Events, Classified Ads, Directory Listings, or All Others. Choose what you would like to create. Once you have clicked on one of the 4 options, TOPICS will appear at the bottom of your screen. Select the TOPIC that matches your post. Some TOPICS have more than one level. Select the SUBTOPIC that best matches your post. Once you have chosen your TOPIC, the NEW POST form will appear. Your content (which could be a link to a website, or much more). Choose if you want to allow reader comments. Then SAVE AND PUBLISH to make your post visible to everyone. Or SAVE AS DRAFT to keep it hidden. View the post and then click the EDIT POST button in the top menu. In the top MENU click POSTS. If you saved your POST as a DRAFT, you can view it using MENU > POSTS. To PUBLISH the POST so it is no longer a DRAFT, view it then click the SAVE AND PUBLISH button. If you PUBLISHED your POST and want to revert it back to being a DRAFT, EDIT the POST and at the very bottom where the STATUS is shown, click EDIT. Use a compelling TEXT HEADLINE. Use the ADVANCED feature in the New Post template to add rich content and links to social media like Facebook, Twitter, and Instagram. Use the Text Editor to add text, links, video, photos, and documents to the same post. Add a SUMMARY of your content that will appear when the mouse is rolled over your TILE or the SUMMARY link is tapped on a smartphone. Add TAGS to make your post easier to find. Take time to format and organize your text so it is easy to read. I want information about how to live there. I'm from South America.